- The SuperArena game against Sweden on Feb 2nd drew more than 7000 spectators. Even though the home side lost to the more experienced opponent the event is considered a promotional success and a milestone in the process of building Polish National Team, its next game is scheduled for September. The opponent and hosting city are yet to be announced . -The launch of Extra Point QB Magazine and VideoBlogs and other. If you are a football fan in Poland You can feel spoiled the new communication platforms for polish football fans have arrived. The first ever printed football magazine Extra Point has been launched and is distributed nationally. The quarterback.pl the new football website has kicked-off. 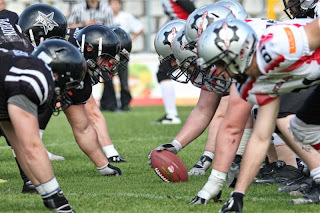 Also the rival Devils-Giants rivalry has gone online with the launch of videoblogs of Giants OL Babatunde Ayeigbusi and Devils DL Arkadiusz Soberski. 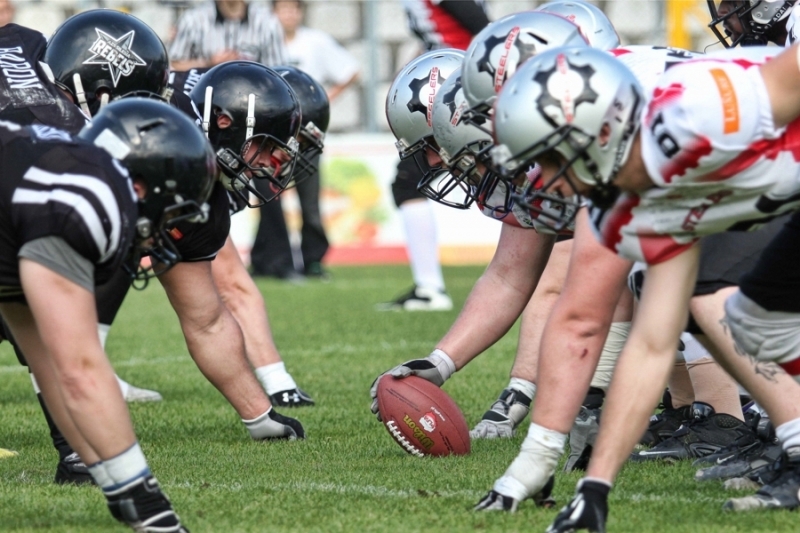 - SuperFinal VIII will again be played in the National Stadium in Warsaw on July 14th, this is a huge success for the PLFA as American football again will have the honor to host its most important game at the state of the art venue. It is also a challenge because as we know the sequel hardly ever matches the success of its predecessor I hope that SFVIII will turn out to be like Godfather 2. -Brace yourselves the winter is staying – the pre-season and the first month of the 2013 season the weather has been the main focus for football fans in Poland. In the TopLiga alone a total of four games have been canceled with Devils Wrocław and Warsaw Eagles being forced to play 10 weeks in a row. It may affect their chances in the final part of the season. As predicted the TopLiga season so far is being dominated by the “Fantastic Four” of Seahawks Gdynia, Giants Wrocław, Devils Wrocław and Warsaw Eagles, yet there are some interesting turns and subplots. In 2013 the PLFA’s TopLiga has been “divisionised” into North and South groups, with teams playing twice within the group and one game against non-division opponent. The defending champs are soaring high with the record of 5-0 and 15 consecutive wins including 2012. They have showed the heart of the champion by winning two key games against Giants Wroclaw and Warsaw Eagles and overcoming injuries to key players RB Sebastian Krzysztofek and DB Maciej Siemaszko. 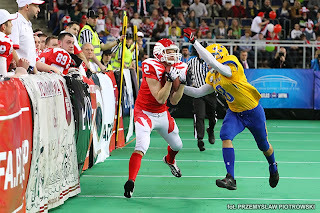 Gaweł Pilachowski stepped in for Krzysztofek while young talented WR Patryk Kordyś has surprisingly emerged as a solid contributor in the pass oriented offense. Ferni Garza is looking sharp at QB proving that Head Coach Maciej Cetnerowski once again made the right choice picking his field general. 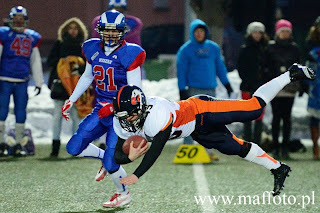 The Giants have decided to gamble in relaying on young yet highly talented Bartosz Dziedzic as their starting QB. So far he is up to the challenge – having arguably the best offensive line is a great help as well as the league’s top RB Jamal Schulterz and experienced WR Mark “MP3” Philmore. So far Mott Goymon led crew has twice beaten the Silesia Rebels won the “PLFA Gran Derbi” against Devils, yet they came short in the statement game against the Seahawks. Schulterz proves to be the difference maker and the offensive workhorse, he’s running his MVP campaign with multiple TD games and 100+ rushing yds performances. We must give credits to the “Big und Uglies” of the OL led by Babatunde Aiyegbusi. The defense with Kiry and Deante Battle is reliable yet hasn’t reached its full potential due to injuries to DE Adam Gabriel Matryba and LB/SS Paweł “Nasty” Świątek . 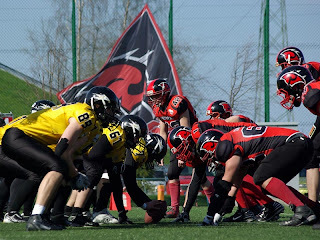 Devils had two of their first four games postponed, the ones that played were convincing victories over Warsaw Spartans and Zagłębie Steelers. The pre-season injury to QB Seddrick Harris caused some problems forced the Devils yet a short term contract with Mexican David Orozco, helped to secure the position. So far the biggest impact in the offense was made by the RB Xavier Glenn, who pounded early opponents. The defensive imports are LB Clifford Perryman and DB Austin Smith, Devils also added depth to their roster by bringing talented polish players experienced DL Arkadiusz”Soberski and LB Arkadiusz Kanicki. The first real test of the year came against The Giants and the 18-27 loss proved that there’s still some work to be done. Xavier Glenn was outshined by Schulterz, Seddrick Harris couldn’t find the rhythm with his talented receiving corps. HC Val Gunn assures that they will play better against the Seahawks - time will tell. Without a doubt “the Dallas Cowboys of the PLFA” this year they have moved to new 6K seats stadium sharing it with soccer’s top divison Polonia Warszawa. The Eagles are in the forefront in the area of promotion and fan-experience, they even launched a private labeled energy drink, yet the on-field results are far from satisfactory. Eagles had two of their games postponed, so far they twice beat Kozły and Steelers but lost 7-20 in their home opener to the Seahawks and it should be the a warning sign. Defense limited the Seahawks this time but lack of production from Shane Gimzo led offense spoiled the chances of avenging the loss in SuperFinal VII. The Gimzo poor decision making in the early part of the season may put him on the hottest seat in the PLFA right now and I wouldn’t be surprised if there was a change of the QB coming. The bright spot for the team is versatile WR Clarence Anderson who can score anytime he has the football in his hands, also the reliable “run by committee“ ground attack helps to move the sticks for the Eagles. Their last game win over Kozly showed that some depth in the trenches issues forcing starting DT Krzysztof Dreger to play in the O-Line. If these problems are permanent 2013 may be another disappointing year of the championship drought. Without a doubt the biggest move of the offseason was made on the sidelines with giving the lead of the herd to Jacek Wallusch, defensive mastermind and one of the best coaches in the nation. His influence could be seen in dramatic improvement of turnover differential and it was the D, who carried the team in victories over Rebels and Spartans. So far the team’s biggest playmaker is versatile serbian native Ivan Pavlovic who has contributed in all three phases of the game and with the recent signing of the QB Jeffrey Legeree he will be able to unveil his full offensive potential. Even strengthened with two imports may not be enough to carry Kozły into the postseason but for sure it’ll increase the competitive level of the team and they have the potential to cause few surprises. Steelers are one of the two expansion teams of the Topliga in 2013 and one of the biggest positive surprises of the season. The team had a busy offseason, starting with the hiring of the new HC Jason Blasko, signing Travis Taylor as QB and bringing back versatile czech WR/DB Ondra Chvojka. With those moves being made the Team’s President Szymon Widera clearly stated the goal for the season as play-off spot at the expense of Devils Wrocław. Well when those two teams met the let’s just give the final score of the game was Devils 48-7 Steelers. Other results of the season for the Silver and Black are loss to the Eagles 41-7 and wins over Spartans 28-0 and Rebels 20-16. Heavy ground attack and opportunistic defense are trademarks for Jason Blasko led team. The upcoming away game against Kozły and rematch with Rebels will be a real test of the strength for the Silver and Black. Two losses to Giants and Seahawks shouldn’t be a surprise but the fact that Rebels could score only 4 points (yes two safeties) in a home game against Kozły and managed to lose a game allowing the opponent whole 9 yds on offense says a lot. The Rebels are victim of the growing role of financial factor in TopLiga, the days of glory when hard-nosed, blue-collared team from Silesia could upset league’s powerhouses are long gone. The team doesn’t have american imports, relying on Poles with the help of few Czech players. 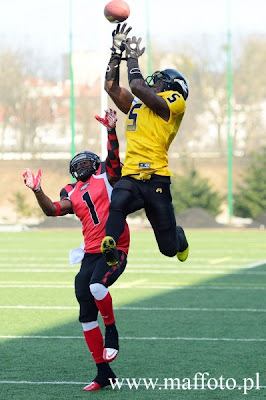 The most painful loss so far came in the “Silesian Derby“ against local rival Zagłębie Steelers. Rebels still have the second half of the year to give some positive moments to their faithful fans “Rebels Nation”. Spartans learn the hard way. The other Topliga’s rookie team and as in case of most rookies the process of hazing is in full swing . The best summary of their season is the famous Rocky scene “…it’s about how hard you can get hit and keep moving forward”. The official statement is that year one is about gaining experience and eventual foreign players will be added in the upcoming seasons. This offseason the only noticeable addition was offensive coordinator Dimos Spiropulos whose main goal was to implement spread offence but without the right QB it’s impossible. The positive signs for the future are a well-run b-squad and juniors program. However if Spartans want to be competitive next season they need to work hard in the off-season and invest in imports. The action in other PLFA Leagues is just kicking into the high gear so I’ll give it a wider description in my next article. So far in the PLFA 1 Husaria Szczecin and Lowlanders Białystosk have both won their first two games and sit alone as clear favorites in their respective groups. The PLFA2 is also warming up, Ravens Rzeszów are only 2-0 team so far, but the biggest upset was the overtime loss of Diabły Wrocław – Devils B-squad to the Pretorians Skoczów . This article should have written after last weekend's games and should be updated to reflect the results. Also I am unsure how many game you have actually watched. The Giants should have two losses, they stole wins over the Devils and the Eagles. Especially against the Eagles who simply blew the game with missed field goals. The Seahawks should also have two losses. They got lucky against the Giants with all the mistakes and bad calls. The Eagles should have only one loss so far and that was to the Seahawks. No way should the Giants have won the game in Wroclaw. Poznan is the only other team that should be in the top league. The Steelers, Rebels and Spartans have no business playing if they are not willing to spend for import players and coaches.